Christmas celebrators, we’re in the home stretch! Are you ready? To keep you in the spirit, I’ll be writing about my favorite Christmas memories all this week. I am obligated inspired to do this by Ms Wanderlust Scarlett, who has tagged me to write about 12 Christmas anythings–that is, I could’ve written about my favorite Christmas carols, presents, traditions, etc. But I chose my 12 favorite Christmas memories, and I’m going to do it in installments because I want to write more than just a line for each one. I hope you understand. I’m also going to use this opportunity to share some Christmas photos throughout this week-long meme. I hope you enjoy it! Feel free to write up your own, if you like, and if you do, please link to me and Wanderlust Scarlett, creatress of the meme, so we can find your list. 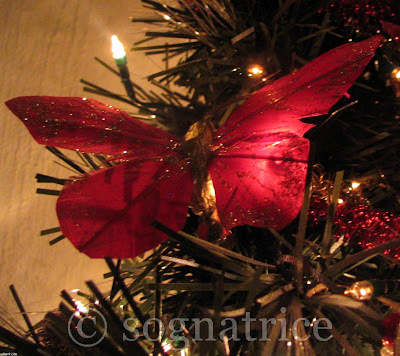 I grew up in a house that virtually exploded with red, green, and gold at Christmastime and I loved it. I loved every minute that those lights twinkled around me and enveloped me in winter warmth–and I always felt a bit deflated once they had to come down after the Epiphany. Every corner was Christmas in my house growing up–even in the bathroom. I don’t know about you, but in my experience, a normally cozy house becomes extraordinarily welcoming and warm with Christmas decorations. Plus I just *love* sleeping by the lights of the Christmas tree. I always helped my grandmother put up the decorations sometime after Thanksgiving; in case you don’t know, I lived with my grandmother, so when I talk about my grandmother’s house, that’s my house too. Decorating was always a big production since everything had to be brought up from the basement, every day knick knacks had to be packed away carefully, lights had to be tested. We’re talking all day, Christmas music blaring fun. And although every year was special, I’ll never forget the first time I was entrusted with the staircase railing. From the first to second floor of my childhood home, there are about 15 steps with a railing that runs up the side–and it’s located right in the middle of the house in the hallway. Other than the tree, and even more than the faux fireplace, *this* was the focal point of the Christmas-themed house. Holly garland, small white lights, old wooden ornaments that I had painted as a young child, other old-fashioned wooden ornaments that lost more arms and legs with each passing year no matter how carefully they were wrapped, stained glass ornaments I had made as an older child, and some of the funniest looking elves I’ve ever seen–plastic faces, cloth bodies, knees scrunched to chest–covered the railing for a good long month. Slight digression: the first year I was in Italy I saw a box of ornaments similar to the old-fashioned wooden ones I always used on the staircase. I couldn’t believe it, but they were kind of steep in price, so I let them sit. Then they were still there the next year, just that one box of ornaments that made me think of home every time I saw it. And I found it in the same spot the following year as well. Well this year I finally bought them because I now understand that they were waiting for me. I’m so glad they’ve been patient. I just loved decorating that staircase, and my grandmother knew it because even when I was in college and she had all the other decorations up by the time I got home for break, she left the staircase bare for me. Rolling out that garland, wrapping lights around it, and then positioning the ornaments just so–definitely one of my fondest Christmas memories. I simply adored how that decorated staircase lit up the heart of the house with a warm glow throughout the holiday season, and I loved that I was responsible for it. Around 4 pm, we’d have dinner–something to hold us over until after Mass, which was usually around 7 pm. It was always fish of some sort as we weren’t allowed to have meat until after we went to Mass. Yes, those were our household rules. But before we went off to church, there were lots of preparations for after church. This is because after early Mass, much of the extended family and friends came to my grandmother’s house for a few hours. There was always ham, potato salad, pickled eggs, deviled eggs, and many trays full of cheese, olives, pickles. Ah, and also suppresata and ringed bologna. And raisin bread. And various nuts. And fruit. And chocolates. And the trays of homemade cookies, of course. And I’m sure I’m forgetting some of the foods; Christmas Eve was a feast second only to Thanksgiving in our house, and a lot of people had to eat standing up because the kitchen was always spilling over with well-wishers. For those wondering about the lack of typical Italian food, don’t worry. It came the next day in the form of homemade ravioli, spaghetti, rigatoni, meatballs, and more. In conjunction with this memory, perhaps a 2(a), is my memory of the first Christmas without my grandmother in 2001. She had passed away less than two months before, and it was so hard even being in that house without her, let alone at the holidays, which were without a doubt her favorite time of the year. My dad absolutely wanted to keep that Christmas Eve tradition alive and so before church, I ran around getting together all the trays and plates and cups and everything that we’d need because, of course, other than my grandmother, I was the only one who knew where everything was and how everything was supposed to go. 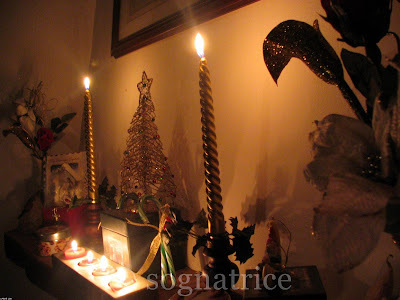 I do miss those Christmas Eves, but I also know they don’t really exist anymore without my grandparents there. But oh what memories I’m so lucky to have. Oh what wonderful memories you have! I can’t help but feel that the bond you had with your grandmother was the biggest part of it. I can’t wait to read more. *Susan, yes I was definitely close with my grandmother; I look forward to sharing more Christmas memories–so fun to write! Your mention of Christmastime revioli reminds me: have you reviewed “The Lost Ravioli Recipes of Hoboken” yet? I read about it in the REader’s Digest and heard an interview with the author on NPR and was fascinated with her experience going to Italy to locate long-lost parenti in order to get their recipes. Since you are the expert in such matters, I want to know your opinion before I buy it! You made me cry. Tightness in chest, lump in throat, burning tears cry. How precious and sweet, those days that are gone but never forgotten. Obligated? Agh! The guilt! Hee hee… but I am very glad you are stretching it out over days… how nice, it will be like slowly enjoying a 5 or 6 course sumptuous meal. I’m very glad you got the ornaments! Mustn’t let things like that go. I tried to vote twice (or more), it wouldn’t let me. Sorry. I loved reading of your memories (thus far). I am glad you are taking your time and letting your words flow, in installments. I don’t know how you waited to not buy those ornaments as soon as you saw them. I would have snatched them up that first year, eager to preserve whatever I could. Everytime you write of your grandmother, I can’t help but to smile. Oh how beautiful! I loved revisiting your holiday memory…it reminds me of all the good memories I have and how I am feeling the need to write about them this holiday season! bellissima. I am going to put on some Nat King Cole now. I feel like your grandmother’s house and my gram’s house were almost one in the same, although no Italian blood in my family. Ham, potato salad, deviled eggs and yes all the rest . . . oh olives. I used to place them on all fingers. Christmas Eve was “the” celebratory event and it isn’t the same with my grandparent’s gone. Still a magnificent time of year but they are deeply missed. Memories are a wonderful treasure to reflect on. I felt so connected to this post. I’m glad you did buy those little ornaments as I think they did have your name on them. I also take away an awareness that my banister is bare! What great memories! Thanks for sharing them. It’s important to cherish these memories and continue to make each year special. We carry these memories with us and, at the same time, help make memories for others to carry with them. *Chickenbells, yes! Write write write! *Cheeky, oh how wonderful! It’s amazing the similarities and connections we find once we start sharing ourselves. I can’t wait to read your 12 things! And, btw, I could really go for some deviled eggs right now…. *MB, so true! And now that we’re in a different culture, it really is like a clean slate for memory making, isn’t it? So exciting! You are so right, how lucky you are to have those wonderful memories! And how lucky we are that you’ve decided to share them with us. 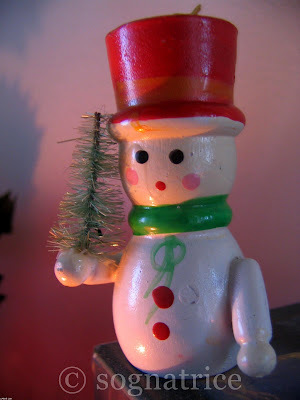 When I was growing up we had a box of wooden ornaments very similar to that snowman (and other characters) too…I wonder whatever did happen to those. There is something really, really cozy about the light given off by multi-colored Christmas lights. We are always tempted to leave ours up all year. I’ve so been enjoying your Christmas memory posts, Michelle. You have the most wonderful family and so many beautiful memories to share. Your nonna sounded very special. I have a feeling that she’ll be watching over you at Christmas and will be very proud of the life that you’ve made and the old *and* new traditions that you’re following now. *Concetta, grazie mille 🙂 Your comment is *very* much appreciated! Oh, yes, my friend — as adults, it’s about the treasured memories, and trying hard to make some of the same for the younger ones. What a time of heritage and love! Thank you for ALL your Christmas memories — this has particularly been a year of fond, poignant memories for me, too. *Ann, I’m so happy you’ve enjoyed my memories; thanks for visiting! By the way, I found my way here from Anali’s place. I have a large lump in my throat and tears streaming down my face that was a beautiful andmormory rushing moment of your life and Christmas as a child but brought back some of the memories I’d forgotten, espically with my Nona in Sicily as I lived there till I was 5 years old. Her kitchen proper was also the stable for the mule and the chicken hutch, there was a natural spring well in the centre and a tiny stove fed by fire logs at the other end bushels of chestnuts and veggies a long wooden table and my tiny chair were I sat and watched Aunts and NONa , baking and cooking and feeding me tibits. I can’t wait to hear more of your story. Sorry for the typing errors couldn’t see the keyboard.